Promote your brand and create beautiful decorations with custom wall decals. 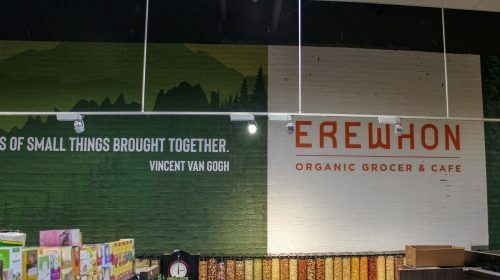 Perfect for indoor and outdoor applications, large wall murals have both business and decorative use. 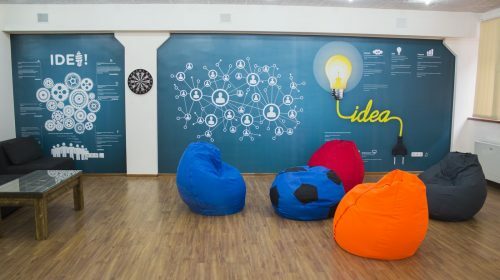 Get wall stickers to brand your office and keep the business spirit with the logo and the name of your company depicted on the wall of each room. Front Signs – an LA signage company – carries a wide range of design options to suit any style, space, and budget. 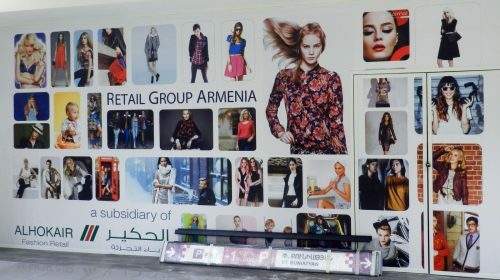 Wall wraps are graphics printed on adhesive vinyl, which can come in any shape, size, and design you want. Wall art stickers are great for turning empty, dull walls into bright and eye-grabbing sights. Create corporate identity in your office or brand events with your company name and logo fixed on the wall with eye-catching wall graphics. Enliven understated walls in your home or create a playful space for children with high-grade removable wall murals. For those looking for a solution to make their room look larger custom wall decals are what they need. 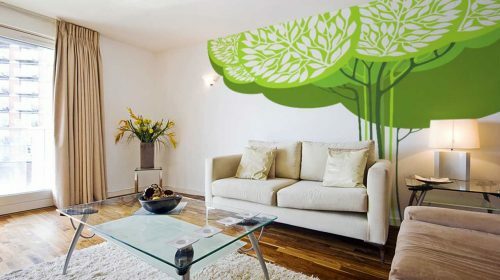 Wall mural stickers with special artworks having depth elements in them create an illusion of a bigger room. These are a great alternative to wallpaper or paints - but unlike the latter two non-toxic wall murals are easy to install and remove without leaving any stains. You can get wall wraps to cover either all the walls in the room or create an accent wall to compliment the overall design. 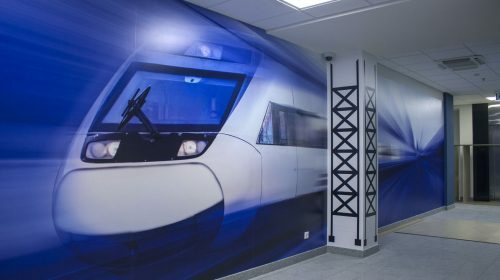 These wall graphics for business are great for office interior branding as well as creating beautiful and unique decorations. Create long-term or one-time decorations for any interior with customized wall art stickers. These are perfect for thematic decorations, print your desired cartoon or movie characters, symbols and any other graphics and display them on your wall. 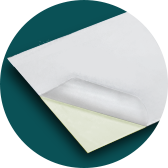 In our LA-based signage company, we offer overline or outline cut stickers. So, the decals will be cut in the exact shape of the design with or without an extra border. Another popular choice among custom wall decor stickers lovers are wall quotes. Be inspired by Front Signs’s wide selection of custom wall quotes decals. Choose your favorite quote, saying, song lyrics and display it on the walls of your living room, bedroom or office to create a motivational atmosphere. Choose the phrase and the design you want to see on your wall and leave the rest to our production team. Wall graphics are one of the latest trends among interior designers. These peel and stick murals are perfect for providing a splash of color to the dull walls with vivid printings. The interior decor of an office should transfer the theme of the company which can easily be achieved by interior branding. 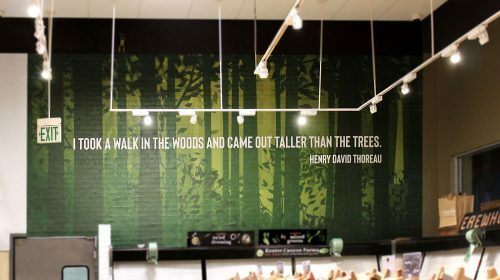 Adhesive wall murals are an ideal tool for this purpose. You can get office wall decals with the name or the logo of your brand and cover the office walls. Also, you can get graphics in the niche of your brand. 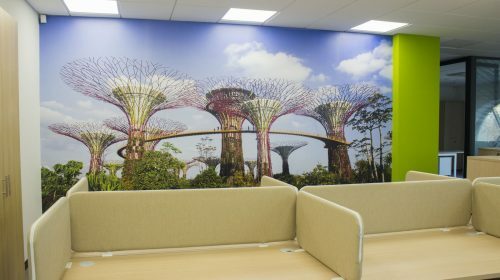 For instance, IT companies can get office wall murals with codes, fashion related brands can get famous brand name decals and so on. Restaurant owners can brand the interior with the graphic of the dishes they offer to increase the appetite of their customers. 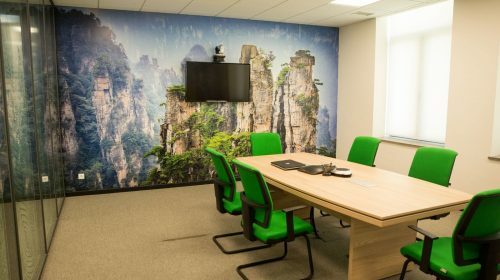 Office space should be inspiring for the staff - motivational quotes on the office walls are ideal for increasing productivity. Nowadays, wall art stickers are a common tool for home decoration. Get a living room makeover and create a brand new interior design for your home with custom wall graphics. Family tree wall art decals are one of the most common uses of modern wall decals at homes. Removable vinyl wall decals can be used for decorating your children’s bedroom. 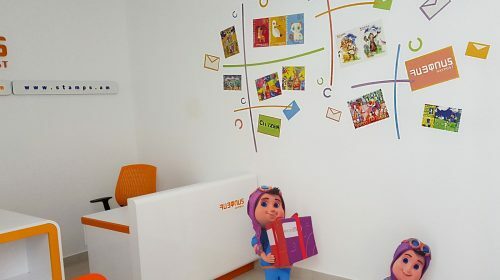 With all the bright colors that nursery decals offer, you can create a fun atmosphere in your child’s room with the graphics of their favorite cartoon characters. You can also add a growth chart wall cling in your child’s room which will help record your child’s height growth. These are a great option for decorating your house. Create an accent wall or cover all the walls with wall decor stickers. Preparing for home redecoration? Wall decor stickers will come in handy. Most people spend a lot of money on painting their walls every year to give their house a fresh look. But it is a filthy process, as you need to take down the old paint and add a new one. Instead, you can use custom adhesive wall decor, which is a more affordable and a neat way of redecoration. And as they do not leave any stains on the walls you can change them as often as you wish. So your house will always have freshly decorated walls. If you have some hobbies you can use custom removable wall decals to decorate your interior space with thematic graphics. Space lovers can get stickers in astronomy theme, sports lovers decals with the logos of their favorite teams and so on. For those preparing for an event - be it a birthday, anniversary, graduation party or any other event - wall art decals will serve as a perfect one-time decoration. Get thematic decals and decorate your special day with your custom graphics. Announce sales and attract potential clients with eye-catching custom vinyl wall decals. These are can’t-miss advertisements that will lead prospects to your place of business. Large wall decals serve as highly-effective promotional tools for all types of businesses. Whether covering the whole wall or just a part of it these wall clings are an affordable medium to spread your message across. 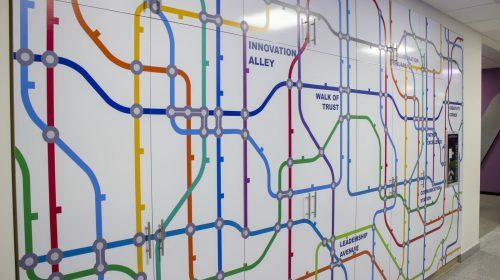 Wall decals can serve as wayfinding signs as well. Arrow decals fixed on the wall can show the direction to the exit, a certain room or guide customers to your establishment. These decals can mark sections in shops, libraries and in any other large establishments. 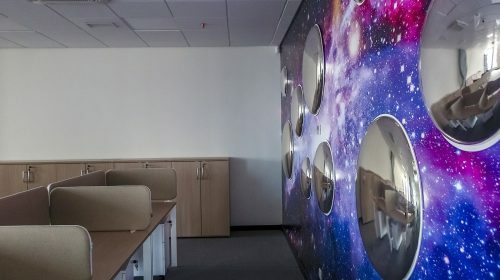 Get unique office room or bedroom decorations with 3D large wall stickers. Graphics of a beautiful scenery can be fixed atop your desk in case if you don’t have a real window in the room. You can create an illusion of a broken brick wall leading to another dimension with wall graphics. UV protected and fade resistant to retain the vivid colors of the printing for a long period. Easy to apply and remove within minutes without staining the surface. Perfect for indoor and outdoor use, as the material is all types of weather resistant. 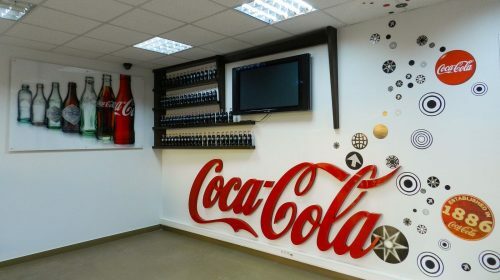 Affordable - great alternative to wall painting, giving the ability to change the wall graphics as often as you desire. Customized - Get the decals in your desired size, color and shape to suit any interior space. 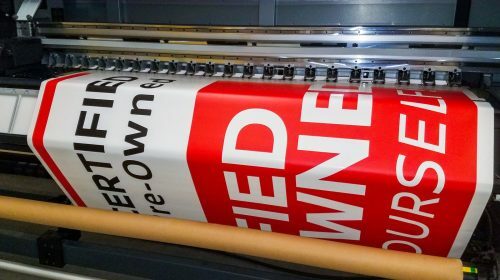 Front Signs - an LA-based sign making and printing company - offers color match printing for removable wall decals. 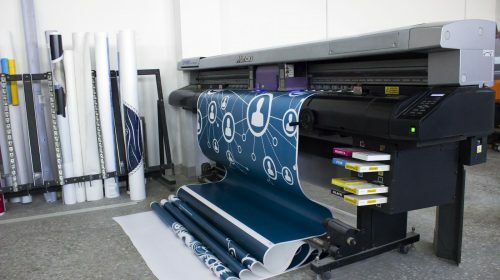 Meaning that the images you provide for printing will have the exact colors on the printed product. 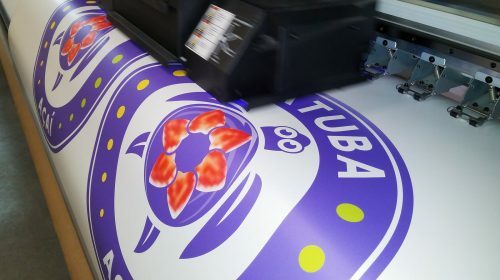 For wall decal printing, we use only top-notch technologies with UV inks. The printers dry the inks with ultraviolet rays, making them sun resistant. Thus the vivid colors of the large vinyl wall decals are guaranteed to remain for a long period. For the installation of large custom wall decals, no tools are required except for a squeegee or a plastic card. You will need only a few minutes for the installation and a pair of helping hands depending on the size of the wall art stickers. Just do the right measurements to know where to attach the wall graphics, take the back paper off and stick it to the wall. But before the installation, make sure that the wall is completely smooth and clean. Preferably the wall should be painted to have an ideal finish. Avoid walls with bumps otherwise, the air under the custom wall murals will not let them stick to the wall perfectly. In case you need a professional helping hand, Front Signs provides installation and replacement services all across the LA to minimize the potential damage and mistakes in the installation process. When tired of the graphics, you can take away these removable wall murals and attach a new one. The removal of the wall art stickers does not leave marks on the surface, thus you can change the design of your walls as often as you want. No specific care is required for wall decor stickers. To keep it in good shape, you need to simply take the dust off with a damp cloth from time to time. Vinyl Lettering - Apart from decorative wall decals, we also offer vinyl lettering for motivational or inspirational quoting to decorate the walls of your interior. Display the name of your brand at the reception of your office to welcome your customers with personalized vinyl lettering. Window Decals - Promote seasonal campaigns or decorate indoor and outdoor windows with custom decals. Choose out of the four types of glass decals and use them for both business and decorative purposes. Floor Decals - Show direction, attract foot traffic or create attractive campaigns with highly-adhesive floor decals. These are a great advertising tool for attracting foot traffic and leading them to your establishment. Vinyl wall signs are meant both for interior decoration and office branding. Most common office branding decals are company name, logo, services and contact information. Custom text wall decals - also known as wall quotes - are very popular. For home personalization and decoration butterflies, family trees and quotes are the favorites of our customers. Wall decals are stickers meant for wall application only. Their special structure allows them to be used for wall decorations without damaging them. 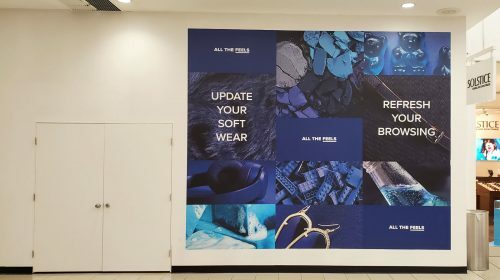 They provide either full coverage of the wall - accent wall … or cover a particular part of it - giving an interesting design with lettering, logo or custom graphics.